Makeup and beauty !!! : MY HAUL ft. LAKME, MAC, LOREA'L, COLOURPOP, CHARLOTTE TILBURY. MY HAUL ft. LAKME, MAC, LOREA'L, COLOURPOP, CHARLOTTE TILBURY. MAKEUP GEEK FOILED EYESHADOWS. All from BEAUTYBAY.COM. Each price:- 650/- approx. 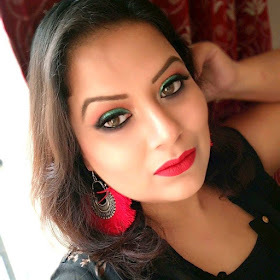 COLORBAR LIP LINERS FROM NYKAA.COM. These are priced as 599/-, I bought few at 20% discount while rest are from color bar store. LOREAL VOLUME MILLION LASHES MASCARA. I bought it from Nykaa.com in 20% discount. VICHY NORMADR HYALU SPOT. I bought from Nykaa.com. Priced:- Rs.850/-. MAC ARIANA GRANDE VIVA GLAM LIPSTICK. Price:- Rs.1450/- (I bought it from abroad). MAC NUTCRACKER SWEET HOLIDAY COLLECTION; COPPER FSCE PALETTE, SO GOOD FOR YOU LIPSTICK. Price :- Not yet confirmed by MAC cosmetics store. MAC STUDIO FIX FLUID IN NC 30. Current Price:- Rs.2450/-. LAKME SUN KISSED BRONZER. Price:- Rs.725/-. LAKME MOON-LIT HIGHLIGHTER. Price:- Rs.725/-. LAKME 9 TO 5 LIP AND CHEEK CONTOUR IN SHADE PLUM FEATHER AND ROSE TOUCH. Price:- Rs. 575/- each. CHARLOTTE TILBURY HOT LIPS MATTE REVOLUTION LIPSTICK IN SHADE SECRET SALMA. Price:- I bought from Insta seller so changeable prices according to dollar rate.